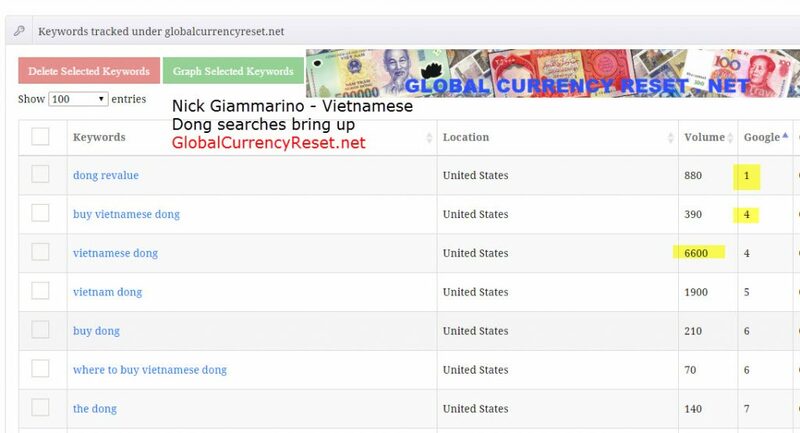 This article and the new video will go into detail about the Vietnamese Dong including why the rate is showing 46 cents on websites such as Netdania.com and XE.com. Also, if you scroll down you will see a shocking chart displaying how much some companies are making by selling this currency. Please share this article with everyone because many are being deceived on a weekly basis. The conference calls are full of disinformation that I am trying to expose. I’m attempting to stop these companies from selling dong because they are charging double for a currency you can buy at your local bank, yes Dinar Inc and Treasury Vault I’m talking about you! 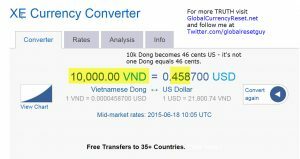 In the video, you can clearly see the exchange rate of 46 cents per dong is per 10,000 units. 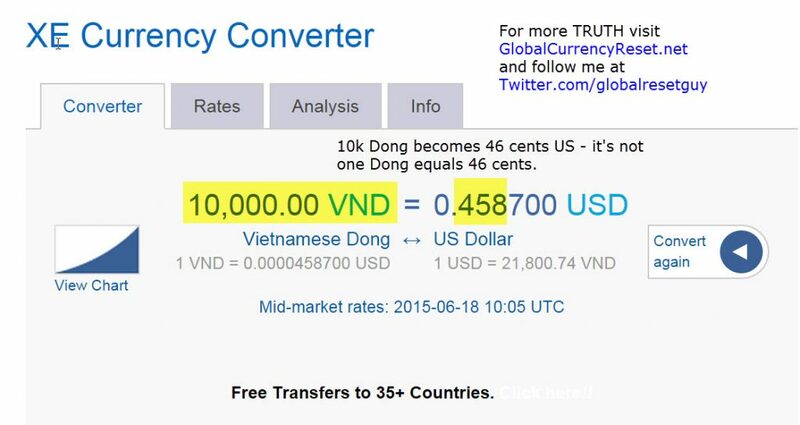 Again, 10,000 Vietnamese Dongs equals 46 United States cents. This is the exchange rate, there are no secrets. I’m sure that most people just missed that, and went off of what the dinar gurus were stating. Just look at their track record, they have been wrong consistently since 2010. Why do I make videos and articles like this one? It’s to warn investors about currency scams. Forbes has been writing about currency exchange scams for years. Also, keep in mind that there are so many websites that sell dong that you should question the mindset of the people selling them. The Vietnam dong is a pretty bad investment in my opinion. I’m not a fan of foreign currency right now, I’m holding U.S. Dollars, and Silver mostly. Silver is great when the inflation rate goes up. 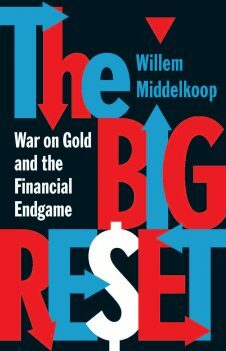 For years, I have been purchasing my currency at my local banks, be it either Chase or Wells Fargo, it didn’t matter to me. 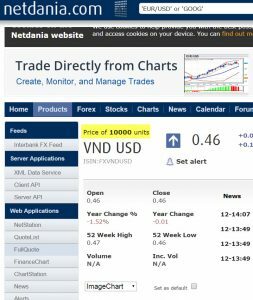 As you can tell by the chart below, the online dealers are making a killing ripping people off by selling Vietnamese Dong. It’s sickening to me. I still get emails from people asking me when it’s going to revalue and what the rate is going to be. I wish I didn’t have to put out articles like this one, however, since many people get their information from criminals like Anthony Renfrow, I’m forced to put out the truth. People look for dong revalue and they find either me, or a guru, hopefully, they find me first so they can know the truth. Finally, please check out the chart below to see just how much money people are spending on currency by buying it online versus buying it from their local bank. 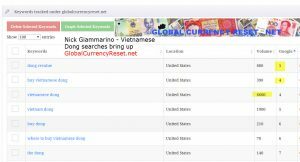 This table was created by Nick Giammarino to prove that it is much cheaper to buy Vietnamese Dong from a bank rather than from an online dealer. I'm sure the dealers will be mad when they see this chart and the video, maybe you dealers should lower your prices instead of rip people off. Share this link with everyone. Here is a screenshot of a program I use to track rankings. Notice where my site ranks for various terms on Google. Thanks for checking this article out, please share it, and comment below, I do read all comments before approving them, so please give me feedback, thanks everyone. I had contacted an online dong seller but fortunately saw your comments on pricing before I placed my order so then went to Chase. Thanks very much. i purchased vietnamese dong a couple of years ago. i paid $166.00 plus for 3million vietnamese dong. are you saying that there is no revaluation? There was no revaluation Merrilee, the 46 cents was a mistake but gurus ran with it. 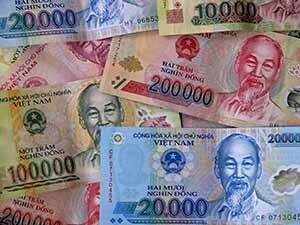 My friend got back from Vietnam, nobody over there has even heard of this, they all think we are stupid Americans for buying their “worthless currency”.